Little Pink AndersonAlvin Anderson was born into the harsh conditions of the racially segregated and economically crippled Carolinas in 1954 Spartenburg. As soon as he could walk he was drafted by his father, the legendary 20�s blues recording artist, gambler and bootlegger, Pink Anderson, as his apprentice in Chief Thunderclouds Travelling Medicine Show. Here he first learnt his father�s songs and later the hustling tales of miraculous cures, and eventually accompanied Pink on a miniature guitar. Sam Charters recorded them together in 1962 for his film �The Blues� billing them as Pink and Little Pink Anderson. This led to pink�s second recording for Bluesville. By the time Alvin�s 13th Birthday rolled around Little Pink was already a veteran performer in the Medicine Show rural bleus tradition but was really more interested in the sounds of the Juke Joints and badgered his father for an electric guitar. Big for his age he passed himself as an adult and went on the road with Clarence Carter�s Band. This in turn led to gigs with other touring R&B artists including Willie Hightower, Archie Bell and his hero Albert Collins. Unfortunately the lifestyle of the road dragged him, like so many before and after, into the excesses of drink and drugs which lead him inevitably into the downward spiral of depression and criminality. Band leaders stopped calling and in 1970 he was convicted of armed robbery and sentenced to fifteen years. For the next twenty three years he spent much of the time in jail or looking for the next fix. His father died in 1974 in abject poverty despite his name being immortalised as the Pink in Pink Floyd. In 1996 he came to the realisation that a hard life is better than no life and he decided to leave his nightmare existence behind. That November he walked away from Pelzer Correction Facility and moved back home to Spartenburg, free and clean. Joining the Palmeto Blues Society he quickly formed a band around his Albert Collins influenced guitar, recorded an indie cassette and soon became a fixture on the local scene. Badgered by members of the Blues Society for acoustic renditions of his father�s songs and other Medicine Show staples, Alvin eventually obliged and quickly the odd number morphed into complete sets and then gigs by Little Pink Anderson. In 2002 Alvin contacted the charity Music Maker for assistance and they recorded a well received album in the Little Pink vogue and began booking him into clubs, colleges and festivals including the Chicago Blues Festival and the �Blues to Bop� Festival in Lugano, Switzerland. At the same time, as Alvin Anderson, he carried on working the funkier Chitlin Circuit with his regular band. 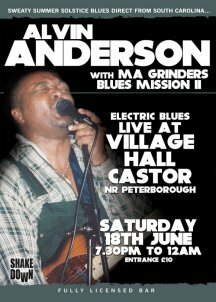 Shakedown presented Alvin Anderson with Ma Grinders Blues Mission II featuring Jeremy Watson, Rex Gates, Bruno Urciuoli and James Goodwin in a storming set of Southern Style electric blues at The Village Hall, Castor and the following day in an acoustic set as Little Pink Anderson with �songs my daddy taught me� at The Stamford Arts Centre.